Application Management Services (AMS) has long been viewed as a “keeping the lights on” function, playing an important role to increase operational efficiency, contain costs, and free up internal resources. But in today’s fast-paced, fiercely competitive business environment, simply keeping the lights on falls far short in providing transformative value for your business. The digital era demands a new approach to AMS. Your business needs to continuously innovate, evolve, and integrate its applications to achieve better business outcomes. That’s why the AMS IT outsourcing conversation today is moving away from tactical efficiency gains to providing strategic capabilities for transformation and innovation. Download the e-book, Application Managed Services in the Digital Age: Consumer Products – Food Industry, to learn how itelligence works with food producers and processors to go beyond traditional managed services into the realm of what is possible in terms of business outcomes and business innovation. 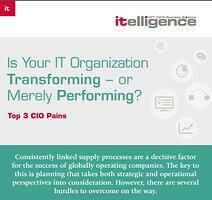 Is Your IT Organization Transforming - or Merely Performing? Solution Brief: How Can An SAP Center of Excellence Help Your Organization?